Quayside Restaurant and Fish Bar, Gourdon. 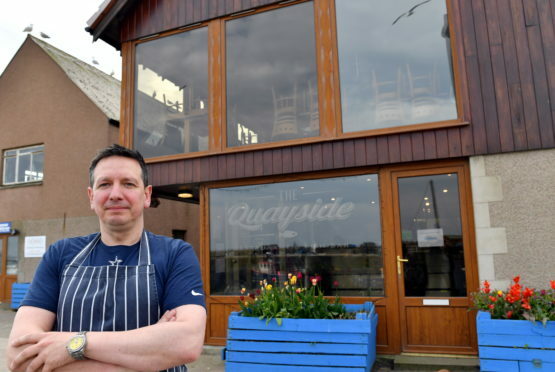 Quayside Restaurant and Fish Bar in Gourdon has been awarded the Best Seafood Week Campaign Award as part of the 2019 National Fish & Chip Awards. This award category was open to entry from all businesses that participated in Seafood Week (5–12 October 2018), an annual event coordinated by Seafish that encourages consumers to eat more fish, more often. Another Aberdeenshire business, Low’s Traditional Fish & Chips, took third place in the UK Fish & Chip Shop of the Year category. Marcus Coleman, Chief Executive at Seafish, commented: “Our annual Seafood Week campaign is a celebration of all things fish and shellfish and is a highlight in the seafood industry’s calendar. “The initiative encourages all fish and chip related businesses to engage with their customers to promote the fantastic flavours and health benefits of fish and shellfish to inspire more people to eat fish more often. Ben Bartlett, celebrity chef and awards judge, said: “The Best Seafood Week Campaign category is a fantastic way to celebrate the great taste experiences to be enjoyed by eating fish and shellfish, and I was extremely impressed by the standard of entries. Raise quality standards and provide a benchmark for businesses to aspire to. The 2019 National Fish & Chip Awards ceremony took place on today at the Royal Lancaster Hotel in London. National Fish & Chip Awards.